If you are planning on installing laminate or hardwood flooring on your stairs, perhaps to match the rest of the flooring in your home, and you plan to perform this work yourself rather than hire a professional, then you will need to take a deep breath. This is a project that can take quite some time and many would say it is not the most riveting work. This DIY project will entail you cutting the stair treads and stair noses within a hair of the sides, and making sure the stair nose, stair treads and risers securely affixed. It is recommended you do this using glue, construction adhesive and nails. If your stairs are currently carpeted, you will have to remove it and see what you find underneath. The stair overhang may need to be removed. You will also reveal tons of staples that were used when the carpet was first installed. You might also find extremely warped or loose treads. You will need to remove all staples and any other debris from the steps. Check and make sure all the treads are flat. If not, you may be able to resolve this problem using screws. An alternative would be to sand high spots with a belt sander. When installing your own laminate or hardwood on the stairs, you need to figure out the type of riser you plan to use. You have the option of going with a painted wood or use the same flooring that you are using on the steps themselves. When you embark on this project, you must thoroughly research the price of all the materials you will need, as well as the tools needed in the event you need to purchase them to get the job done. You will want to use quality tools when engaging in this effort to ensure you get the job done properly with a professional look. Keep in mind that stair nosing tends to be expensive. Luckily, you can typically use one section of nosing on two stairs. For planning purposes, estimate approximately 3 square feet for each step or tread. To be safe, you should always purchase a little extra to accommodate for any mistakes you make along the way. It is also nice to have extra flooring in the event you have to perform repairs at a later time. The tools you will need to accomplish this DIY project include a nail gun, circular saw, sliding miter saw, and table saw. You will also need some hand tools. You should also get some putty that matches your wood or laminate flooring that you are installing to fill in any gaps and nail holes. what is good vacuum for laminate floors ? 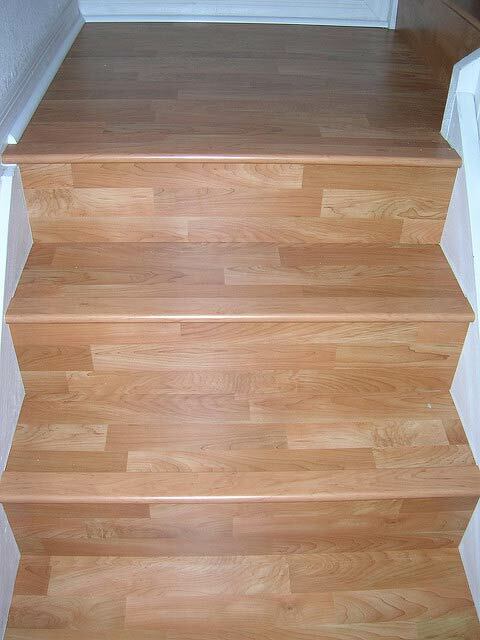 Installing laminate or real wood stairs yourself is certainly no easy undertaking and takes a good deal of time. It is vital that you thoroughly research how to perform this work, and what is needed to do it, such that you are fully prepared to install your new stairs and make it look like you hired a professional to perform this service.